On Sunday, September 3, 2017, Fr. 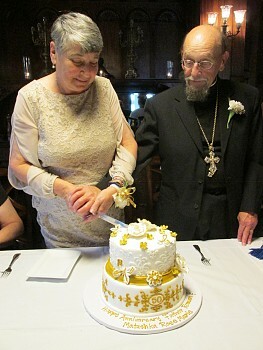 Roman and Matushka Rose Marie celebrated their 50th wedding anniversary. For the Divine Liturgy, four additional choir singers, one for each part, enhanced our choir whose singing sounded extra special and beautiful. At the end of the Divine Liturgy, a beautiful message from our Bishop John was read out-loud by Fr. Daneil, and the framed message was presented to them. (See photos in slide-show.) Following the Divine Liturgy, a surprise, modest, informal luncheon with a beautiful cake was enjoyed by all the parishioners, family and guests. Then in the evening, a private formal surprise celebration for family and friends was held at the Whitney House in downtown Detroit. Both the informal parish celebration and the formal private celebration were planned and organized by Father and Matushka's daughter Elizabeth. The family members who attended the 50th celebrations included: Matushka’s sister Barbara and brother-in-law Harold from Tennessee, and her brother Thomas; Father’s brother James and sister-in-law Iris from Pennsylvania; their daughter Elizabeth and her husband Larry; their son Greg and his wife Tamiko; and their grandchildren, Caitlin and Zachary. They are prominently depicted in the 70 photos of the slide-show.